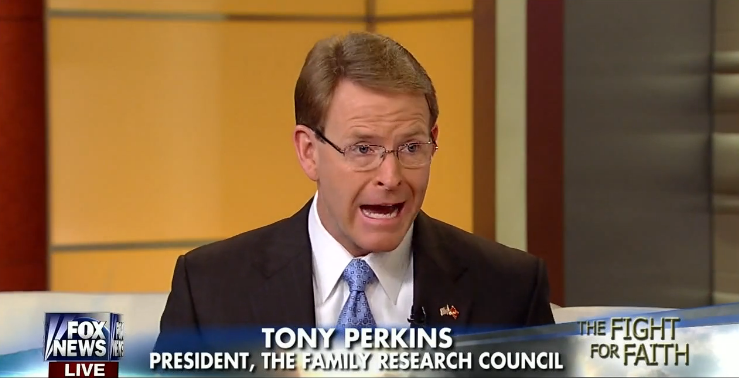 Family Research Council (FRC) president Tony Perkins has all but ceased to appear as a guest on CNN and MSNBC. It’s a dramatic change for the anti-gay hate group leader, whose constant appearances on cable news during the 2012 GOP primary cycle drew criticism from progressive faith groups. Since becoming president of the Family Research Council in 2003, Perkins has used his position as a leader among social conservatives to command significant media attention. FRC hosts the annual Values Voters Summit, making Perkins an easy choice for networks looking for a prominent voice to comment on social conservatism and GOP politics. Over time, networks also began turning to Perkins for commentary on LGBT issues like the fight over marriage equality and the repeal of “Don’t Ask, Don’t Tell.” Perkins was happy to oblige – he has a history of making incendiary comments about LGBT people, and FRC has turned the production of anti-gay propaganda into an art form. In 2010, the Southern Poverty Law Center labeled FRC an anti-gay “hate group,” citing the organization’s propagation of known falsehoods about LGBT people. Perkins’ platform on cable news didn’t sit well with audiences familiar with his long and sordid history of bigoted anti-LGBT rhetoric. Faithful America, a progressive Christian group dedicated to “reclaiming Christianity from the religious right,” launched a petition in February 2012 asking the network to stop inviting Perkins on air. The petition garnered 20,000 signatures, which were delivered to MSNBC’s headquarters. Perkins’ platform at MSNBC created an awkward situation for Hardball host Chris Matthews. At a March 2012 book event, Matthews was asked about his willingness to invite Perkins on his show and admitted that his critics “may be right.” At a book signing a few weeks later, Matthews told Faithful America members that the group had “a good argument” for no longer hosting Perkins.” Perkins did appear on Hardball once more, in a joint appearance with gay Rep. Barney Frank (D-MA. But rather than offer the warm welcome Perkins had come to expect, Matthews grilled Perkins on his anti-LGBT extremism. In the summer of 2013, Faithful America launched a similar petition targeting CNN after the network hosted Perkins to discuss the Supreme Court’s ruling on Section 3 of the Defense of Marriage Act (DOMA). The petition urged CNN not to let Perkins “speak on behalf of America’s Christians” and quickly gathered more than 32,000 signatures. While Perkins has virtually disappeared from MSNBC and CNN, FRC’s anti-LGBT bigotry and misinformation hasn’t entirely faded from the airwaves. In February, CNN’s Crossfire hosted FRC senior fellow Peter Sprigg to champion an Arizona bill that would have allowed businesses to refuse services to LGBT people. In May, the network turned to the FRC’s Ken Blackwell for his thoughts on gay NFL player Michael Sam. CNN’s willingness to host lesser-known FRC figures shows much work remains to keep anti-gay extremists off of cable news. But if CNN and MSNBC have indeed decided to stop hosting Perkins, that’s undoubtedly a major step in the right direction.